How to Recover data from Corrupt PST file in Outlook 2016, 2013, 2010? MS Outlook, as we all are aware of, is one of the most used email clients when it comes to usage in both personal and corporate verticals. When it comes to data storage of Outlook, the entire data is stored in PST (Personal Storage Folder) files. For every Microsoft Outlook account, multiple PST files can be created. Similar to other data files, these PST files are also prone to corruption and damages. When an Outlook data (.pst) file get corrupted, that PST file becomes inaccessible. This, in turn, leads to inaccessibility of the PST file data items like emails, contacts, calendars, tasks etc. In this blog, we will discuss the reasons leading to PST file corruption and the methods by which we can recover data from corrupt PST file. The most dominant reason responsible for the corruption of PST files is its size. Since Outlook 2002 and all the below versions support ANSI type PST files. The maximum data that can be stored in the PST file is 2 GB for Outlook 2002. In case the data stored in the PST file size exceeds 2 GB, it will surely result in PST file corruption. Overwriting PST files with garbage data is also responsible for the corruption of PST file. At times, this overwriting can be done by recovery tools. In such situations, it is necessary to recover data from corrupt PST file efficiently. Hardware issues like hard drive or storage device failure often lead to corruption in PST file. In addition to this, accessing and copying PST file from a remote connection is also a reason for PST corruption. Virus intrusion is one of the most common reasons behind PST file corruption. The viruses intrude the PST file, corrupt the internal structure of PST file and damages it completely. Abrupt shutdown of the system or improper shutdown of Outlook is also considered as one of the probable reasons behind PST file damage. How to Recover Data from Corrupt PST File? Recovering data from damaged PST files is not a task that can be done manually. Therefore, in order to do so, third-party solutions are deployed. One such software, which facilitates perfect recovery of data from Outlook PST files, is SysTools Outlook Recovery software. The software has been developed in order to recover data from corrupt and inaccessible PST file. After recovery of data from PST files, it enables the users to save the data in a new and healthy PST file. In addition to this, it also offers PST, MSG, HTML and EML file options to save PST files emails separately. It can also export Outlook PST files into Office 365 account. The users can even recover permanently deleted messages from PST file and can store them in a new PST file. It is the best solution for ensuring perfect data recovery from corrupt or damaged PST file. Microsoft Outlook is prone to corruption and damage. 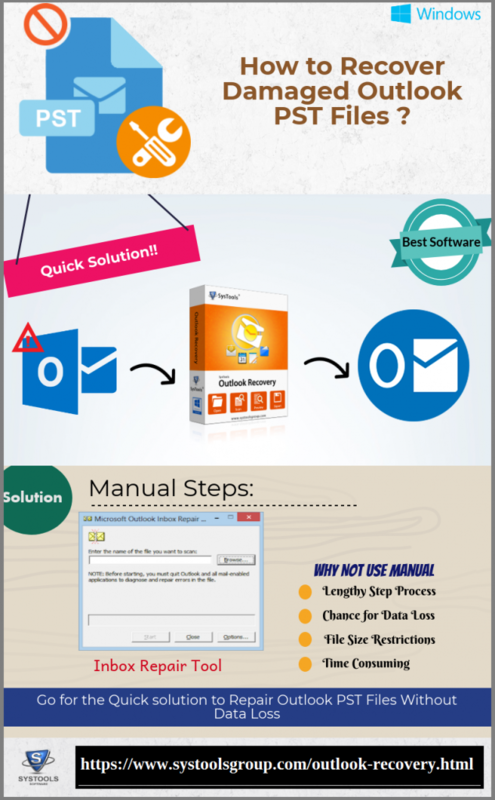 Repairing and recovering damaged Outlook PST files is not an easy process for a novice user. The blog explains the best solution to recover data from corrupted PST file. It also explains various factors that result in PST file corruption. Understand the problem in your Outlook PST file, and resolve it efficiently using the above-suggested application.